Teaching students to take turns: Me First! Around October or November, the kinder and first grade teachers and parents usually ask for a lesson or two about taking turns. 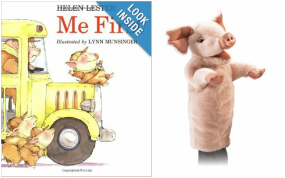 I bring in my Folkmanis pig puppet and introduce him as Pinkerton, the main character of the book, Me First! by Helen Lester. After reading the story (which has a super cute play on words that some students really catch onto), I have Pinkerton ask students what he can do instead of the more selfish behaviors from the start of the story. Students are eager to provide examples of kind behaviors, and if there is time, Pinkerton acts out a few for the class! I discovered Sandra McLeod Humphrey's Hot Issues, Cool Choices while an intern in graduate school. At the time I used the book for individual and small group counseling with fifth graders. This year, I have been using it for classroom lessons with the same age group. Students seem to connect and remain engaged with the content, which is rare in my experience! As I stated earlier, I have used these stories to help individual students who are feeling helpless or pressured to open up and then problem solve their own experiences. I have had small groups discuss a story and determine ways to prevent or stop such choices from happening in their friendship circles. Recently, I taught a lesson about empathy and perspective taking. After reading a story aloud, students got into heated discussion about what they would do. Eventually, it became clear that these issues are real and pervasive in my students' lives and they were finally discussing it openly and freely! Therefore, I can recommend this book highly. Check out the Amazon reviews, as well!